I’m writing this on the Monday morning after a great weekend and somewhat crazy week before that packed with excitement and travel. We spent most of the weekend away in Cheshire at my parent’s house, as we had been invited to a birthday party for one of Jill’s friends from University. It was Nikki’s big do, an 80s themed birthday party held in the local village hall. Obviously, this meant fancy dress – or at least pseudo-eighties garb – was order of the night! We weren’t completely certain what we were going to wear, but Jill carried out her research in detail and quickly pegged Primark as a source of cheap 80s look-alike clothing. Neon leg warmers, Bat-wing tops, bangles and ra-ra skirts abounded, providing a concerted assault to the eyeballs. Jill was quickly outfitted in a somewhat 80s glam outfit. Fortunately for the sanity of everyone else, I avoided ra-ra skirts and neon brightness by being an... 80s PIRATE! Well, actually, I went as Adam Ant, but the DJ had forgotten about Ant-Music, and had nothing on his laptop. (Have you noticed how all DJs seem to be using laptops with iTunes these days?) The make-up was quite scary. I was fortunate that Geoff, Nikki’s husband is an old friend as the stripes I got from make-up transfer onto Nikki’s cheek when we greeted each other were very obvious! I also got to meet a large number of Blues Brothers (although some claimed they were actually Suggs from Madness), a Ghostbuster, and an extremely healthy looking Freddie Mercury and a fellow member of Queen complete with Dyson to help them break free. We had a fantastic evening, complete with fake beer and wine (well, Jill and I weren’t old enough to be on the booze for most of the eighties!) which meant no hangover the next morning. Whilst we were doing this, Nathan was looking after his grandparents, which he managed to do with appropriate levels of cheek and cuteness. I got to do real roleplaying at work on Wednesday, as we ran a major crisis simulation exercise with the emergency services etc. It was very tiring, but great fun. I think that doing that full time would be a dream job for me! I've just finished migrating from my Palm Centro smartphone (itself a replacement for my Palm Treo 650) to an iPhone. Yeah, so I really wanted to get a Palm Pre, but that meant changing carriers, and generally O2 has worse coverage than Orange around here (*). Anyway, rather than talk about the joys of the iPhone (which are many), its advantages over the Blackberry Bold (my work phone, sadly locked down, sweet keyboard) or Palm Centro (lovely for its time), I though I'd mention 2 hero applications which I have just updated from Palm OS to the iPhone. The first is Splash ID; at its heart, this is just a password manager, but I've used it on Palm OS for maybe 5 years or so, and it's really good. There are also Mac and PC desktop packages that cross link to it. Very useful if you have a lot of passwords etc. Details here. The second is Tube London, which comes in two different versions; one which has the traditional Tube Map, and the other which has a geographical map of the centre of London. Both are £2.99. I had this on my Palm, and as an occasional visitor to London found it really useful. I tried the free TfL app, but that doesn't seem to give the most optimum routes. This supports the over the air tube status updates as well, and doesn't need to connected to a network (mobile or wifi) to work. So I upgraded to a souped up version of an old friend. It also has popular locations linked in with details, and you can get the A to Z map to match. Lovely stuff, which has apparently been on an iPhone ad. Details here. It's been a crazy few weeks, and there is no sign of a let up for at least another week. 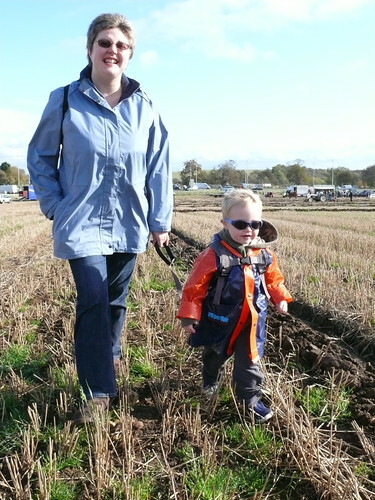 I forgot to mention that we'd had fun at the end of October at the ploughing match, which was like heaven for Nathan. A big collection of vintage tractors in a field just at the edge of Wetherby on a bright autumn morning. Nathan was doing his cool dude routine with his sunglasses on, and didn't know where to look. 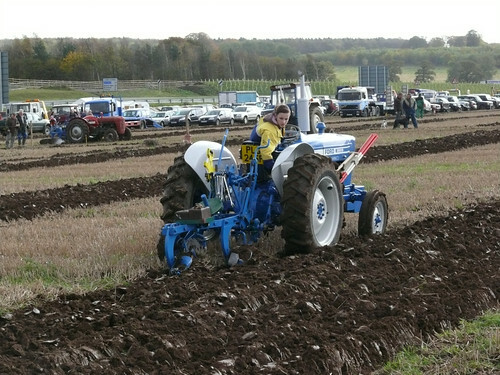 I was amusing by the old timers who were watching a young lady ploughing the field, and looking good at it, and making all these comments about how great it was to see a family tradition being carried on. However, it did look a little like they were having a good oggle too. The next weekend, we went to see Jill's parents in Birkenhead. The big expedition here was to a model railway exhibition with Nathan's Grandad, which Nathan seemed to enjoyed. I din't find it that exciting, as some of the displays were fantastically detailed but – in honesty – pretty boring. However, small boys and trains is always a good mix! 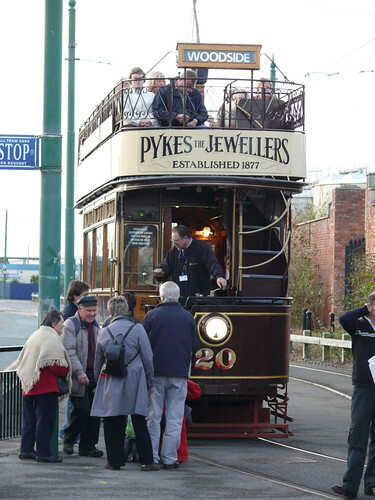 Once we finsihed at the show, we headed out to the transport museum on a tram. This went via the Woodside Ferry landing (for 'Ferries across the Mersey') which has recently gained a German WW2 U-Boat. Nathan loved the trip, and got quite excited by the museum full of old vehicles and trams too. Great fun, overall. Last weekend was Firework Night, and Wetherby had it's usual big display on the Ings (the flood plain by the River Wharfe where the old racecourse was). 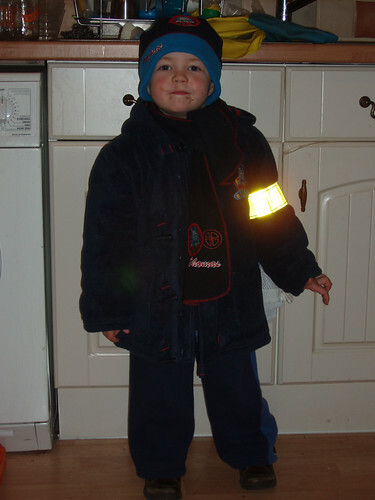 Nathan got all dressed up for the trip out in the cold, finally conceding the week-long battle and wearing his new coat. There was a Thomas the Tank Engine fairground ride at the display, so I'm sure you can guess what he liked most about the trip out. He did seem to like the fireworks though, and it I get a few minutes I may YouTube some of the video. The Sunday that followed had a 'TomCon', one of our regular gaming get togethers. I was spoiled for choice in games; either Traveller (my favourite of old) run by Graham or Wordplay (the new game which I laid out) in a Cyberpunk setting by Newt Newport. I was more than happy to play either, so held back to let those who were more bothered go first. I ended up in the Cyberpunk game, which was great fun, taking me back to some of my 80s gaming roots. Yet again, Elaine and I ended up with characters who just didn't get on! I also swiped the fantastic slow cook curry recipe from Tom, our host. This weekend just gone involved an evening out for Jill and I. One of my team at work has recently completed 25 years service and I was hosting at our Long Service Dinner. This was held at Hazlewood Castle, which is a great venue, and we had a great time. The only semi-dubious thing was the Swing singer; he was very good, but it really wasn't quite what I expected, and I'm pretty certain Jill hadn't expected a serenade and a kiss. At least she didn't get "The Lady is a Tramp" dedicated to her, which was what happened to the event organiser! Paula and Mark – Jill's sister and her fiancé – kindly looked after Nathan for us so we could go out and be grown-ups for once.